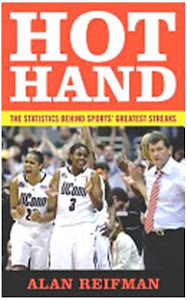 Hot Hand, the book, will be part of the Texas Tech University library's annual faculty authors exhibit, beginning Wednesday, October 17. I am shown in the upper-right corner of the Brady Bunch-like promotional video, trying my hand at different sports and games. Take a look by clicking here; it's very cute!